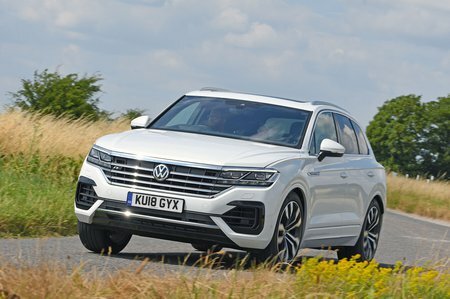 Volkswagen Touareg 3.0 V6 TDI 4Motion SEL 5dr Tip Auto 2019 Review | What Car? What Car? will save you at least £3,857, but our approved dealers could save you even more. SEL trim gets plenty of equipment including an automatic gearbox, four-wheel drive, 19in wheels, LED headlights, dual-zone climate control, leather seats that are heated and have adjustable lumbar support up front, a 9.2in touchscreen infotainment system with a DAB radio, sat-nav, Apple CarPlay, Android Auto, adaptive cruise control, lane-keeping assistance and automatic emergency braking. Add air suspension and a couple of other choice options and it’s all you need.